President Diaz-Canel criticised the move by senators Marco Rubio and Bob Menendez to reactivate the Bush-era strategy. Cuban President Miguel Diaz-Canel has condemned the call by two U.S. lawmakers of Cuban origin to reactivate the 'brain-drain' program established by George W. Bush and revoked during the administration of Barack Obama. “They’re trying to impose a perverse strategy to stimulate brain drain. Another anti-Cuban campaign that shows the imperial impotence against the revolutionary conquests,” Diaz-Canel wrote on Twitter. Senators Marco Rubio and Bob Menendez, respectively from the Republican and Democratic parties, filed a resolution at Congress on Thursday calling for the reactivation of the Cuban Medical Professional Parole (CMPP), known as “brain drain” by Cubans. “Cuba has been sending medical brigades around the world, including Central and South America as well as Africa, for over forty years - in return for payments directly to the government estimated to be as much as $8 billion per year," it reads. The resolution can define the Senate’s position on the issue, but the ultimate decision to re-establish the CMPP rests with the State Department. Installed in 2006, the program aimed to lure Cuban doctors and health professionals working on special missions abroad to abandon their duties and emigrate to the United States with special incentives. Obama repealed the program in 2017 after the improvement of diplomatic relations between the two countries, and recognized the work of health professionals. According to government data, Cuba has sent more than 600,000 doctors to over 160 countries since the foundation of the ‘More Doctors’ initiative in 1973. Their labour has been recognized by the UN and the World Health Organization as good practice and an important step toward the 2030 sustainable development objectives. Also, Cuban medicine schools have trained over 35,613 foreigners from 138 countries, completely free of charge. Cuban Foreign Ministry director for the United States Office, Carlos Fernandez de Cossio, also rejected the initiative by Rubio and Menendez. "Impotent resentment against Cuba has no limits. Unable to stop recognized human professional development, baseball quality and potential investment. Bob Menendez and Marco Rubio want to restore brain drain program against Cuban doctors," said Fernandez de Cossio. 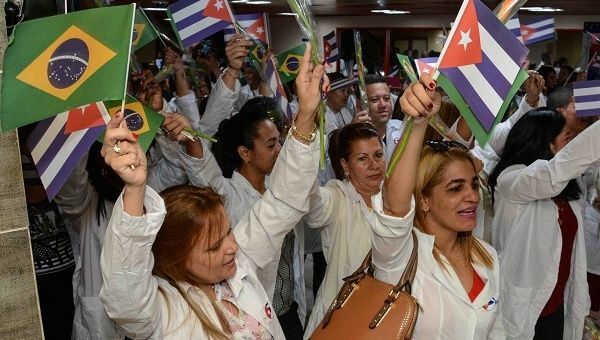 Both senators argued that Cuba was profiting from the work of its health professionals in Brazil, where Cuba ended its ‘More Doctors Program’ in November after comments by then President-Elect Jair Bolsonaro questioning the quality of Cuban doctors’ training. The news was met with sadness by the Brazilian 'Doctors for the People National Network' (RNMMP), who regretted the loss of about 8,500 health professionals working in historically marginalized areas. "It was an example that favelas, backlands and the Amazon can have doctors. An example that the poor or black people can be a doctor. An example that the state must guarantee the right to health. An example of Latin American love,” the RNMMP press release declared. The ‘More Doctors Program’ was approved by former President Dilma Rousseff in 2013 in order to increase access to public health for the Brazilian population. One of those policies consisted of assuring budgetary resources for implementing family-based health strategies, increasing medical vacancies in universities and offering more courses in the field of medicine. During the five years it lasted, about 20,000 Cuban physicians assisted thousands of Brazilians in primary health care. Besides the CMPP resolution, Rubio is also attempting to veto an Obama-era ruling allowing Cuban athletes to join Major League Baseball without first having to defect to the United States.